Microsoft Access provides the creation and management of databases at a much higher level than what enables eg. Excel. One of the advantages is the unlimited amount of records in the tables. Use the queries obtained from the tables the information we need, and allow them aggregate results. 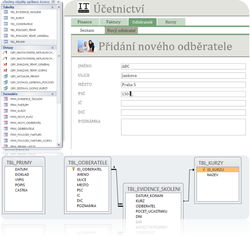 Thanks to the forms you can create your own user interface so users have easier access to data. To print the data we use reports. Why buy expensive programs, when you can have all the records in Access? Let ITLektor show you the mysteries of this powerful application. (Čeština) Online kurz Access – Tvoříme databázi Sorry, this entry is only available in Czech.